Looking for entertainment books? Biblio.co.nz hosts hundreds of of the finest online book stores and booksellers, including specialists in entertainment. Use the list below to locate a specific specialist bookseller or book store near you. Or, use the form below to search the inventory of all booksellers who specialize in entertainment. Keener Books (Member IOBA) (Keener Books & Collectibles, LLC) is an exclusively online bookdealer, located in Menomonee Falls, Wisconsin, near Milwaukee, Wisconsin on the southwest side of Lake Michigan.We specialize in books relating to food, fine dining and entertainment, although we also carry books in many other subjects, mostly non-fiction.All of the photos shown are actual pictures of our books. We do not use stock images. What you see is what you receive. 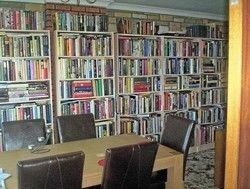 Roy Coomber is a retired bookseller with over 60 years experience of the second hand and antiquarian book trade. He is disposing of a large and interesting stock comprising of railways and other transport, military, art, collecting antiques, and many other subjects. Dealing in Musical and Entertainment Autographs and Manuscripts, Antiquarian Music, Music Books, Prints, Photographs & Paintings of Musical Interest, and Rare Music and Entertainment Ephemera.